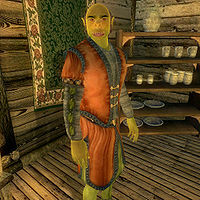 Brokil gro-Shatur is an Orc commoner who spends his entire life in Silverhome on the Water in Bravil. He sleeps in the first bedroom on the right on the floor above the taproom from midnight to 6am then heads downstairs. At 6pm he eats dinner at the table in the back of the inn, but otherwise he spends his entire time in the tap room chatting to the staff and patrons. Brokil certainly enjoys his relaxed life. The first time you meet him, he will introduce himself as "Brokil gro-Shatur, Lord High Warden of the Taps, Gilgondorin's most prized customer. I taste everything. Over and over. And over again..." and when asked about Bravil, will reply, tongue-in-cheek, "It is a terrible responsibility, being Bravil's First Citizen of the Ale Tub, but I suffer under the burden like a Sure-Green Orc." He wears a russet felt outfit and shoes and carries a few gold coins. At midday, Brokil is supposed to take a stroll around town centered on the Lucky Old Lady statue, as long as the final stages of the Dark Brotherhood questline are not running. However, the check requires that Following a Lead has not reached stage 30 and that Honor Thy Mother is at stage 100 or later. Clearly this is impossible. To work, the and should have been an or.